A group of Swedish divers is working on creating a wreck park in Lake Vättern. Vättern is Sweden’s second largest lake and is located in the center of the country. The wreck was protected by the law 1999 because of its historical value, and as such prohibited to dive on. 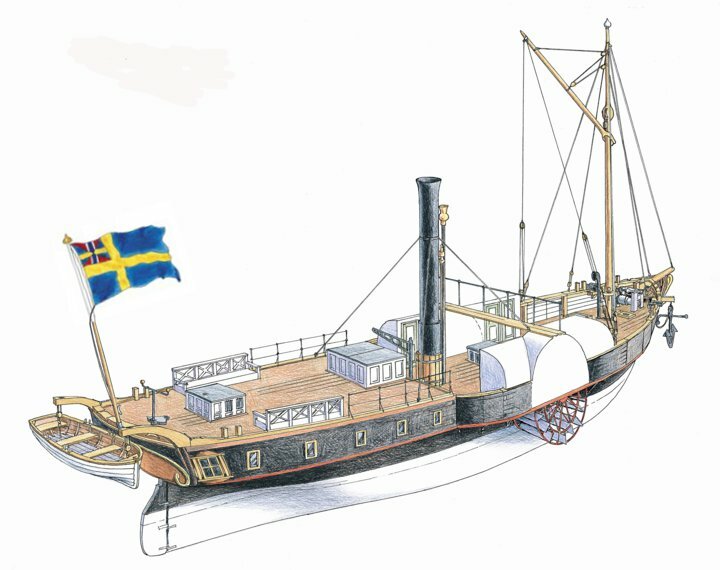 After reading about other efforts to create a historical wreck park for divers in Sweden, the group became interested in doing the same. The process of applying for the wreck park includes carefully documenting the condition of the wreck. They worked for one and a half years to get the permit to do the dives as research for the park, and got it. If they succeed, and the park is established, another survey of the condition of the wreck will have to be done in one year, regarding how diving has affected the wreck. The extraordinarily well-preserved wreck of the Eric Nordevall sits upright on the bottom of the lake at a depth of 45 meters. That means it’s out of sport divers reach, so the park itself will be aimed at tech divers. A number of other well-preserved wrecks in the lake will also be included in the park; some wrecks will be within sport diving depth, but it will be advanced diving. I had a talk with Erik Rådström, who started the project. I was interested in what inspired him to try to create a park like this. It is not exactly an easy task! Erik told me that he’d wanted to dive Eric Nordevall ever since his uncles dove her in 2001. They showed him some fantastic videos of her, and after seeing the amazing footage, he set a personal goal of diving her some day. In the beginning of 2009, he read about how the Swedish maritime museum planned to develop a dive wreck park at Dalarö in Sweden. It turned out that much of the work that needed to be done he needed to do on his own, resulting in late hours and few hours of sleep. As soon as he came home from his day job, he started working with the dive park project. He feels it is all worth it, though. Sure, it is hard work, but in the end, something good will come out of it. The work he and his team are doing will open the area up for other divers and give them a great experience by visiting a one of a kind, a truly unique wreck site! BK: Given the 45-meter depth of the main attraction, how will tech diving figure into the operation? Will you allow sport divers to dive on depth-appropriate wrecks, or will the park’s management only cater to tech divers? ER: Eric Nordevall will never be available for sport divers. You can’t do safe dives at that depth when you are at that level. There will be other suitable wrecks at shallow depths, so there will be a wreck for everyone at any level. BK: What do you think is the most important aspect of establishing a tech wreck park like the one you are working on? ER: The hardest thing with the entire project is the work we have ahead of us when we are going to discuss who is suited to guide and arrange trips to the Eric Nordevall. One person’s right is another person’s wrong, so it will be a difficult discussion. I don’t put down all this time, so a shipper can go and do as he wants, and it results in damages to the wreck. We have examples of shippers anchoring in wrecks from the 19th century and dragging it until it hits the wrecks. We need a way to keep them away from the start. BK: Any clever names in mind? The name is Dykpark Vättern. It’s a brand that will include several companies in the future, just like Dalarö Dykpark. BK: Are there any dive centers involved to run the logistics and if so which one(s)? ER: No centers at the moment, it is too early in the process to start talking to dive centers about these things. BK: I read a little on the system you came up with to anchor the boat at the wreck site. Can you tell us a little about that? Are there any other major tasks you are currently working with to make this work? ER: The anchor system is a combination of several different systems I read about on the Internet. We think it will be a good solution at the wreck site. The bottom at the wreck site is sand, and we decided to use used brake drums from a large truck; they weigh 50kg each and look like a piece of pipe. They sink themselves into the bottom, and by putting a chain in one side of the drum, it will dig down in the bottom if you pull on one end. We chose to put a buoy at 6m, because if the buoy at the surface gets cut, we won’t need to go down 45m to pick up the line. It’s also a good thing to keep as a reference on deco. On our next dive, we are going to dig them down a bit in the bottom so they stay in place. We are also going to place a line between the wreck and the anchor line. Nothing can be attached to the wreck, so we will be putting a weight near the side of the wreck and attaching the line to that and a small float to hold it up at the same level as the upper deck. BK: What do you envision as the end result? ER: I picture a wreck diving park with wrecks at all depths for all types of divers and the Eric Nordevall as a main attraction for tech divers. Many of the wrecks are dived regularly by the local diving clubs. They are great wrecks that are worth visiting even for divers from other parts. We just need to advertise them for the public. BK: Anything else you would like to share with us that you feel is of importance? ER: I would like to encourage all of you out there with an idea to go for it. If it is a good idea, you will succeed, but it will take more time than you ever could plan for! It will never be fun all the time, but the good moments will carry you through the rough parts if you set your mind to it. If everyone does one thing for the diving community, we will have fantastic options in the future!